Lava lamps have been a staple in teenage bedroom decor for many years. They are fascinating and fun to watch. But how do they work? 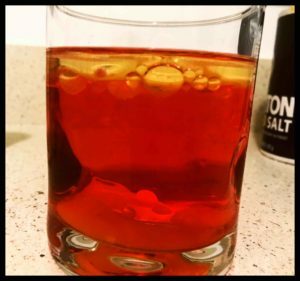 In this fun activity, you will see how density can create lava-like effects when different substances are put together. All it takes are a few household items, and you are ready to go! *Note: Instead of salt, you can use Alka-Seltzer for a more continuous effect. Fill the glass of water about ½ to ¾ of the way, depending on the size of the glass. If using food coloring, add a few drops and allow to settle. Slowly pour in the vegetable oil and allow to float to the top. Whenever you pour oil and water into a cup together, they don’t mix. As we learned in last week’s activity, this is because oil does not dissolve in water. But, why does the oil always float to the top rather than sink to the bottom? The answer lies in the density (the total mass per unit volume – or how “tightly” the molecules are packed together) of the two liquids. Because water is denser than oil, the water sinks to the bottom while the oil floats to the top. 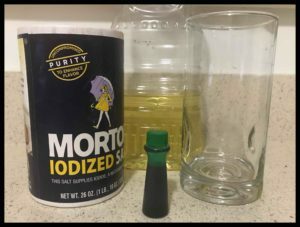 On the other hand, salt is denser than both oil and water, so when you add salt to the mix, it sinks to the bottom and brings some of the oil down with it. Once the salt dissolves, the oil floats back up to the top. This is what makes the “lava lamp” movement happen, and it looks pretty cool!